These are the states we have finished so far for After the Tribulation. 29 states down, and 21 to go! The After the Tribulation States Project is a mail campaign to get a copy of the movie, After the Tribulation, into the hands of every independent fundamental Baptist pastor in America, and we are doing this one state at a time. 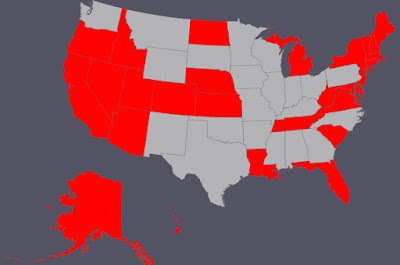 We’ve already completed 29 states, and we have 21 more to go. We have already done the same thing with two other films, New World Order Bible Versions and Marching to Zion. Virtually every fundamental Baptist church in America got those two DVDs. The packages were sent out to over 6,000 churches, and we are working on doing the same thing with After the Tribulation. These mail campaigns really work. A great example is Pastor Joe Major in Violet, Louisiana, with whom was had a very successful New Orleans soul-winning marathon back in June. The way he first heard about us was from the New World Order Bible Versions DVD he received as part of the states project. He enjoyed the film, and the rest is history. Brother Major, who was already a dynamic preacher and soul winner, is now post trib, and was a keynote speaker at the Red Hot Preaching Conference in July, as well as at the Post Trib Prophecy Conference in November. These films really are making an impact and helping people. The pre-trib rapture is a fraud, and many pastors are waking up to that fact. We need to keep the momentum going by getting this important documentary to every IFB pastor in America. Paul Wittenberger and Framing the World are doing this for the absolute minimum cost that it takes to produce the DVD, package it, and mail it out, which works out to only about five dollars per pastor. People can donate at framingtheworld.com to whichever remaining state they would like to help sponsor. Donating to the After the Tribulation States Project in your home state is a great way to make sure the pastors in your area all get a copy of the film. Click here to sponsor a state for the After the Tribulation States Project.